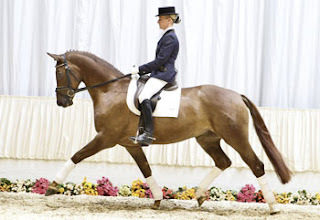 Behind the Bit: Hanoverian Verband Auctions: What are they like? Hanoverian Verband Auctions: What are they like? In August the Hanoverian Verband sponsors an elite auction that is considered the ideal way to buy mares and foals. Here is the link to a list of videos, pix, and descriptions of the horses at this auction. Serious eye candy! The auction list and videos (including information about Redford, pictured left) are here. The best way to buy a Hanoverian is at the Verden auctions. The wide selection on offer at the auctions shows something for everyone. Foals, brood-mares, riding-horses, stallions - here erveryone can find the horse that suits him. Moreover the horses offered at these auctions are selected out af al large number of horses. Twice a year a selction commission goes on a tour through the whole breeding area and selects the best horses at places which have been stipulated in advance. 700 to 800 horses are regularly shown for each riding horse auction. For the Elite Foal Auction there are frequently no less than 500 foals presented für selection. They have 12 auctions a year, and each is a little different in the type of horses offered and quality/pricing. To find a performance horse the Elite auction in April or the Summer auction in July might be the best choices. For a stallion prospect attend the stallion licensing and sale in October. Finally for mares and foals the August Elite auction may offer the best selection. If you want to prepare to purchase a horse at auction, and need the nitty-gritty detail and advice from someone who's been there, read this great article (below). It's by a DVM who went to the auction and came home with a wonderful Latimer son. One of my dreams is to go and watch one of these auctions -- maybe someday (sigh). Have I mentioned before how jealous I am that you have a Hanoverian?! Not to mention the fact that Riley has the cutest face on earth. The thought of this auction makes me want to squirm and drool. The only warmblood I can afford would be the fake kind - some kind of hideous backyard bred Gypsy Vanner Arabaloosa or something equally awful. Oh to have a Hanoverian! I think Riley is the King of Cute and I love him dearly. Buying a "whole warmblood" was quite an investment for me, but I know I'm lucky. My fear is that I won't be able to live up to his natural talent. He may be a natural athlete, but I'm not! Thanks for the compliment and I hope you find a way to make the horse of your dreams happen, whatever breed it is.